Down to the sea again…. …to the lonely sea and sky. 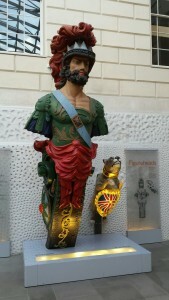 Not so lonely, however, in the National Maritime Museum’s Neptune Court on a half-term Thursday which was thronging with children of all ages. It is some years since I visited this museum and since my last visit it has undergone a re-organisation. The Neptune Court is another ‘great courtyard’ glassed over ( see Scenes at the Museum ). It has a single storey rectangular ‘box’ at its centre, to provide more exhibition space and offices and house the ‘Great Map’ on its roof. Not quite what Sir Christopher Wren ( architect of the Royal Naval College ) or Inigo Jones ( architect of the Queens House ) might have thought of, but a very clever use of space and modern technology. From the fabulous figureheads mounted on the stone walls ( I liked all of them, but especially loved the dog, see right ) to the gilded barge belonging to Prince Frederick ( see above left ) there was much to admire. The reconstructed stern windows of a Nelson-era ship of the line, suspended from the wall above the shop is quite spectacular, as is the huge modern ship’s propeller. There were smaller models aplenty and some interesting memorabilia of life afloat, from the cramped ‘tween decks conditions on an ocean clipper, to the luxurious ocean liners, with their bone china crockery and deck games. Incidentally, on the subject of Clipper, suepsails, the Story Bazaar sailor, will be resuming her series of blog posts shortly, with some tales of life on the southern ocean. The Nelson rooms are now called ‘Nelson, Navy, Nation’ and still contain a wealth of detail about life afloat in Nelson’s Navy, during the Napoleonic Wars, a period which inspired so many superb adventure stories ( see Naval Novels ). 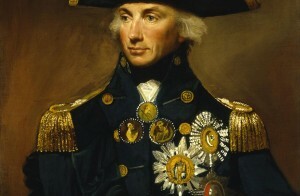 There is a history of Nelson’s life and many of his personal possessions, including his uniform. Turner’s ‘Battle of Trafalgar’ is given a special gallery all of its own. Galleries which we did not have time for on this visit include ‘The Atlantic’, ‘Maritime London’, ‘Jutland’ and ‘Traders’ showing the history of the East India Company, probably in a rather different way to that shown in the Tate exhibition Artist and Empire. A new wing, courtesy of Sammy Ofer, has been added, providing a basement exhibition space, rooms to house the Caird Library and a pleasant, glass-fronted area for a cafe and a brasserie, overlooking Greenwich Park. The cafe was very full when we were there. 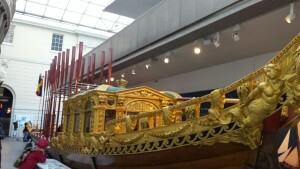 The National Maritime Museum is definitely worth a visit. Best to assume a very long and full day – there’s an awful lot to see and, mostly, for free. So, if you don’t have a lot of time you can just wander in for a couple of hours. The museum web-site lists opening times. The title of this article is, of course, from John Masefield’s ‘Sea Fever‘ – ‘I must go down to the seas again, to the lonely sea and sky, and all I ask is a tall ship and a star to guide her by.’ It is inscribed on the wall between the Caird Library and Neptune Court. 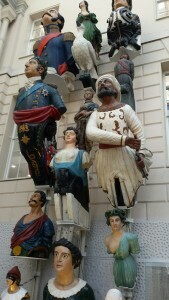 This entry was posted in Art, History, London and tagged History, London, Worth a visit by juliej. Bookmark the permalink.